The round robin format ensured that each player played against the rest of the participants in his/her group, increasing the overall amount of matches played by every particpant. “This enabled them to play many matches – gaining great match experience, which is so much needed amongst Namibian players,” Says Nortje. 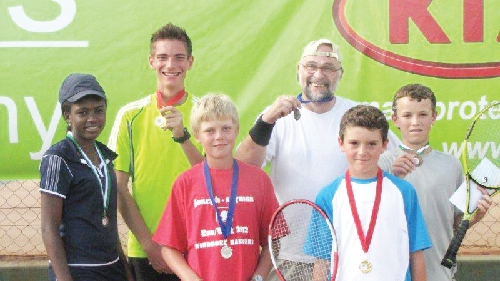 Highlight of the tournament was a gripping match between young Michiel van Zyl and veteran Robert Riethmueller. Van Zyl was able to win the marathon against his experienced opponent, and thus became the well-deserved winner in the Advance category. Riethmueller received silver while Luke Symonds-Mayes came third. In the beginners’ group, spectators also witnessed close results. Delvin Losper was able to surpass his opponents and earn gold, while second- and third- ranked Ryan Symonds-Mayes and Thadrin Thuys were on equal points and thus had to face each other in a head-on-head match. This was finally won by Symonds in a tiebreaker (7/6). The same point difference was decisive in the midi court category, placing Kayden Schnelle on the first rank one point ahead of runner-up Kiana Cormack and third ranked Lisa Yssel. In the mini category Japhet Haarman received gold, Tangeni Nuulimba silver, and Lenton Losper was awarded the bronze medal. The top three of the intermediate group were Oliver Diggle (gold), Oliver Hoffmann(silver) and Martha Venasius (bronze). The next tournament in the KIA PTA Series will take place on 16 & 17 March ‘12.